Romanesco, rainbow carrots, party cauliflower and watermelon radishes — the vegetables of the Great Veggie Adventure — are just four of the many vegetables that farm advisors with the UC Small Farm Program have worked with recently. 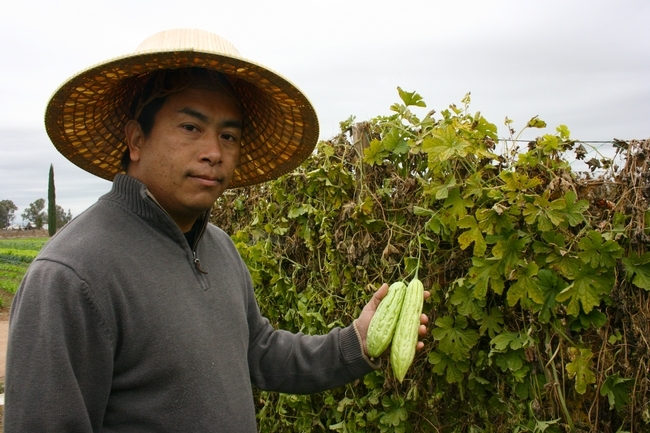 Richard Molinar, farm advisor with UC Cooperative Extension and the Small Farm Program, frequently finds himself on his own "vegetable adventures" when visiting Hmong and Lao farmers in Fresno county with Michael Yang, agricultural assistant. We walked between the trellised crops and up and down the plant rows, while Yang and Molinar picked samples and talked about how to eat these new-to-me vegetables. Since Tchieng Farms sells at farmers markets, they maintain a wide variety of vegetables throughout the year, planting different vegetable varieties every few weeks. Michael Yang, UC Cooperative Extension agricultural assistant who also speaks Hmong, picks bittermelon from the many varieties at Tchieng Farms. 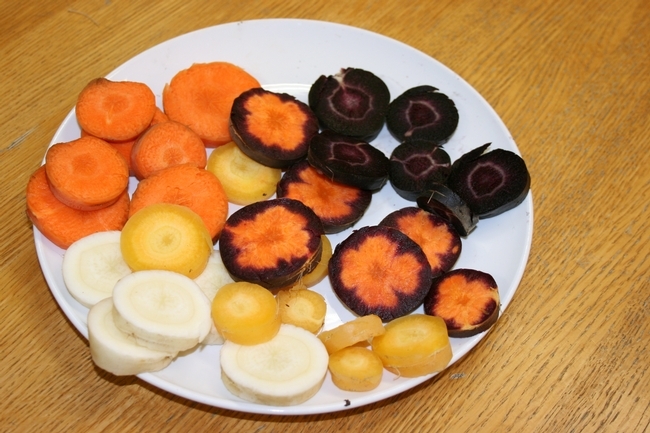 Each color in this rainbow's array of carrots is actually a different variety of carrot. Photo by Manuel Jimenez. While growing vegetables for the Great Veggie Adventure, at least one California farm found a new product to sell at its farmers market booths. 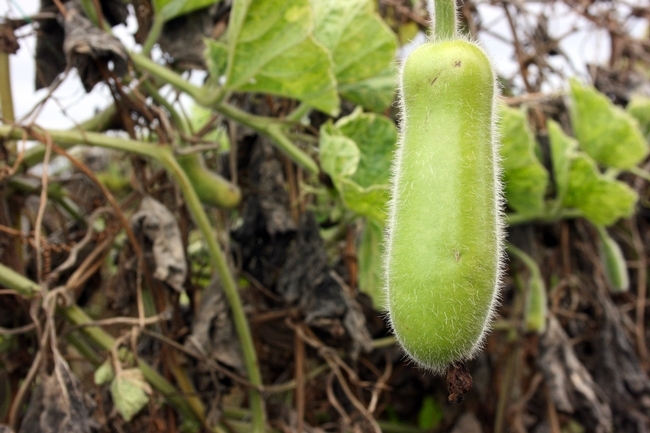 Valdivia Farms in Carlsbad normally grows heirloom tomatoes, baby squash and specialty bean varieties. But Ramiro Lobo, UC Cooperative Extension farm advisor with San Diego County, asked them to try some colorful varieties of cauliflower, carrots and radishes as part of the Great Veggie Adventure. "We don't have a research station here in San Diego or close by, so they've allowed us to do research on their farm. That's been invaluable," Lobo said. Lobo worked with the farm to have a demonstration plot of rainbow-colored carrots, party-hued cauliflower, watermelon radishes and Romanesco as part of the UC Small Farm Program's work with the Great Veggie Adventure. "After I had the samples I needed, I told them they could pick and pack the vegetables. They bunched all the different colors of carrots together," Lobo said. "I heard chefs in Los Angeles and Santa Monica markets wanted them, so they planted more." Javier Valdivia, a supervisor at his father's farm, called the multi-colored bunches of carrots a "hot item." 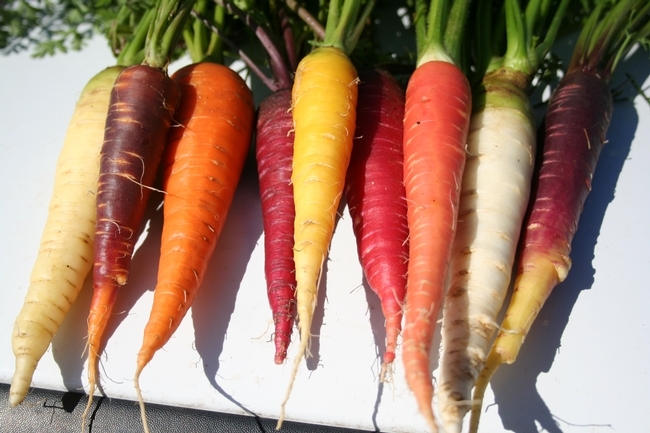 Some colorful carrot varieties are a single color, while others are still orange on the inside. "Chefs and other customers really dig them because they add color to their plates," he said. "The carrots were pretty popular, and they were selling out at the farmers markets. So we just continued with them." He said they're still growing the purple, red, yellow and white carrot varieties, which can be grown almost year-round in the San Diego region. Valdivia Farms sells at farmers markets seven days a week in San Diego, Los Angeles and Orange counties. In addition to selling their specialty items at about two dozen farmers markets, they also sell wholesale and from a produce stand on the farm. Lobo has been working with Valdivia Farms for about 12 years, growing trials there (blueberries, blackberries, dragon fruit, miniature melons) and sometimes answering their agricultural business questions. "It pays for some of these farmers to try out new products. You never know what's going to spark interest," Lobo said. "Don't be afraid to try new things in small quantities and bring it to market." Before you can plant vegetables for a field experiment, you will need ... a field to plant them in. Sure, you'll also need a seed or a plant, some tools, some knowledge and a variety of other things. But definitely before you can plant anything, you need somewhere to plant it. Sometimes the "where" of planting is in a pot, in a greenhouse or in a garden. But other farm advisors don't have access to a field station, so they work with local farmers who agree to allow the farm advisor to use part of their fields to test plants. 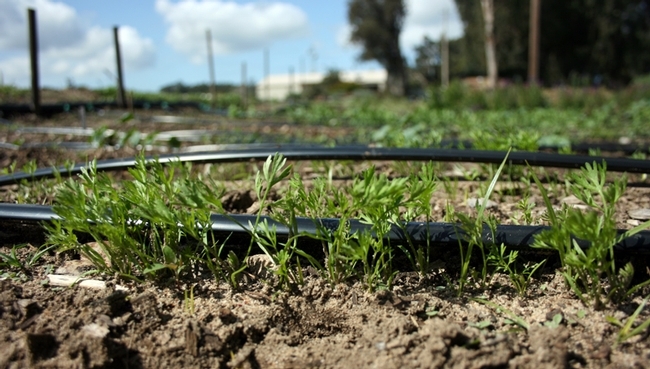 For our part of the Great Veggie Adventure, farm advisors with the Small Farm Program are planting vegetables in five counties in different parts of California — some at a Research and Extension Center, and others at cooperating farms. In Santa Barbara County, Mark Gaskell has worked with a cooperating farm called Growing Grounds. Growing Grounds farm in Santa Maria is a non-profit farm and wholesale nursery that provides horticultural therapy and job training to mental health patients. Recently I had the chance to visit Mark and get a tour of Growing Grounds from Ariella Gottschalk, the farm's program manager. Mark and Ariella showed me rows of vegetables and flowers, a brightly painted farm stand and even some chickens. Then they picked some of the vegetables that were almost ready for harvest, to see how well the plants were growing. When I visited, the farm had different rows of colorful carrots that had been planted during different months. Many of the carrots in the field were still too young and too small for harvest — some were smaller than my pinky finger! I also had the chance to talk with Mark about some of the basic science behind field experiments like this one. One of the questions I asked Mark was: Why do we need to keep planting those vegetables over and over again, and in five different locations around the state? Play the video above to hear what Mark had to say. Carrot tops from very young, very colorful carrots at Growing Grounds farm. ... or have a question? Ask away. How do we measure a 'great' plant? Farm advisors will record when the seeds were planted, along with other data, to compare varieties of carrots. For the Great Veggie Adventure, farm advisors with the University of California Small Farm Program will be field-testing varieties of rainbow-colored carrots, watermelon (or red meat) radishes, party (colored) cauliflower and Romanesco. But what do we mean by "field-testing"? In agricultural science, there are actually several different methods to test how well crops grow in the field. 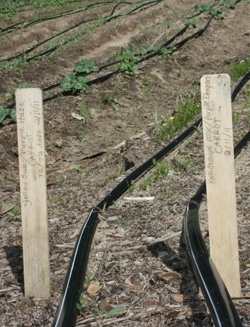 For this project, farm advisors are planting varieties of vegetables, monitoring the plants' growth and recording information about the plants. Farm advisors will also judge the plant's appearance, whether its health looks very good, good, fair or poor. "What I'm looking for there is vigor, color, leaf size, stalk size and other characteristics. Do the plants look healthy and vigorous?" 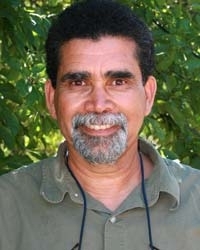 explained Aziz Baameur, farm advisor in Santa Clara, Santa Cruz and San Benito counties. "This is very subjective, but gives us a general judgment of plant health and allows for comparison between different varieties of the same vegetable." To help judge how many of the seeds grew into plants, the farm advisors will estimate the "stand" in the field. To do that, they will count or estimate the number of plants per a given area, for example, per square foot. From this example, which variety of plants grows the biggest individual carrots? Some vegetables are harvested all at once, while others are harvested repeatedly every few days or every week. So the farm advisors will also record when, how many and total weight for each time they harvest vegetables. How can this information help a farmer? When farmers are deciding which crops to plant, it is important they know what to expect so they can make plans to sell their vegetables. How many days does it take for a particular variety of Romanesco to grow from seed to harvest? Does this other variety of plant grow smaller or larger radishes? If I plant 100 seeds, how many plants can I expect to grow? The answers to these questions will vary based on the vegetable variety, where it is planted and when it is planted — which is one more reason why UC farm advisors are planting the same varieties throughout the state at numerous times.